Bit of a quick and spoOo0Ooky episode this Halloweek as I prepared to head off to India (hello from Mumbai everyone! ), but Malik and I got together again to chat about this week's Top 7 Articles on dev.to. This week, we realized we messed up picking our Host's Choice last time, and we quickly recapped Max Antonucci's piece on web accessibility from last episode. Congrats to Max for making it into the Top 7, and to us, for having such great taste :D.
From there, we moved on to a project highlight from user "James", in which he covered nonsensical recruiter emails, and a project he made using Create React App to help developers highlight crazy experience requirements. Jess Unrein hit me close to home on a week where I not only lost my .bash_profile, but a whole damn computer, with a great post on making terminals more user friendly. Adrián Norte won our "Spicy Post Of The Week" with "Why Branching On Git Is Wrong", spurring some interesting discussion between us and in the comments section on his way to the top. Aly Sivji brought us an exhaustive introduction on testing philosophy, history, and the "why", "how", and "what" of testing. In awe of the size of this lad. We discussed the strong case Arik made for Java, along with the value of boring stacks and productivity over novelty. 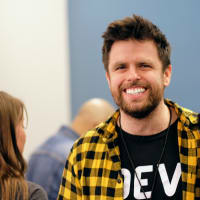 And finally, we spoiled a few of Matt Stratton's jokes from his great post on the myths surrounding DevOps (go read it)(go read all of these). Any thoughts on Test Pyramids versus Test Diamonds? What's your favorite shell alias that you have baked into your config? Now that you've read Matt's piece on DevOps, any tips on what to read next in the space? From Matt Stratton's "Myths surrounding DevOps": "...A lot of people think they know what they are talking about, but they really don't....". I feel like that is the internet in general. And, to me, the high humor per line comes from "...If your microservice only does one thing, it can’t have an error. That would be an additional thing..." :D Love it! Yea, that's my general feeling nowadays when a new high-level or organizational approach is demo'd/debuted. I feel like there is too much of a reward for jumping on hype trains and not actually thinking about how things work or their down-stream effects.